Tributes have been paid to a "true Manx gentleman" who has died at the age of 87 after a lifetime of "selfless commitment" to the Isle of Man. Jack Corrin served as the most senior judge on the island between 1988 and 1998 and supported a wide range Manx charities. 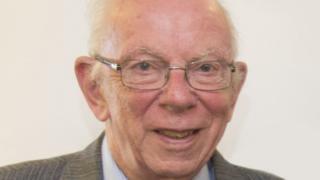 The Manx Blind Welfare Society (MBWS) said Mr Corrin had made "an outstanding contribution" to island life. Along with his late wife Pat, he championed the charity for 50 years. Mr Corrin was appointed its chairman in 1980 before becoming president in 2012. Chairman Charles Fargher said he had carried out the role with "great professionalism and much pride". The charity's headquarters in Onchan, which was opened in 2003, was named Corrin Court in recognition of the couple's "tireless work". Mr Corrin also supported a number of other charitable causes, including the Manx Workshop for the Disabled, of which he was chairman of for 28 years. President of Tynwald Steve Rodan described him as "a modest man in disposition". He added: "He was a true Manx gentleman who gave, along with his late wife, selfless commitment to the island and its welfare." After training as a lawyer, Mr Corrin was appointed the island's attorney general in 1974 before becoming second and then first deemster in the 1980s. He was made a CBE in 1995 and granted the Freedom of the Borough of Douglas soon afterwards. In 2012, he received the Tynwald Honour, the highest award that can be bestowed on the island, for his "worthy work and selfless commitment".